SVS Prime Elevation is advertised as the world’s most versatile home theater speaker and that statement is not far from the truth. SVS Prime Elevation was primarily designed as high-performing height effect speaker and it’s a great choice if you need that kind of speaker, especially if you can’t install in-ceiling height speakers for some reason and you don’t want to use Atmos modules. Before we even start reviewing this speaker let’s explain the two most popular types of height speakers. The first type are in-ceiling speakers. The greatest problem with in-ceiling speakers is that they don’t sound as good as speakers with cabinets. The second problem is the installation (drilling, cutting, wiring). You have to make holes in your ceiling and you have to wire the speakers which can be a long and painful procedure. The second type are height modules. They usually rest on your front left and right speakers (radiating the sound towards the ceiling) and create an illusion of height due to sound bouncing off the ceiling. This type of speakers is much easier to install, but they don’t really offer the optimal experience because it depends a lot on the size and shape of your room. The speaker’s frequency response, especially treble response, have to be recessed in order to get the best possible performance. That basically means that these speakers can only be used as height speakers. They are not a decent choice if you need a front, center, or surround speaker. Prime Elevation speaker is basically a high-performance speaker with an angled front baffle. This kind of design represents a compromise between in-ceiling speakers and height modules. It’s much easier for installation than in-ceiling speakers and it delivers much better listening experience than height modules. It’s an awesome height speaker, especially if you don’t want or you are not allowed to drill holes in your ceiling. You can install it high on a side wall (wall brackets are provided), and aim it at your listening position. Since this is a direct-radiating speaker, the manufacturer didn’t have to limit the frequency response or anything like that. They just made a high-performance full-range speaker that creates convincing height effects. What makes this speaker really amazing is the fact that you can use it not only as a height speaker. Since it’s a full-range speaker, it can also be used as a front, center, or surround speaker. So, you can make a whole home theater system with 5, 7, 9, or more SVS Elevation Prime speakers. You just have to add a subwoofer (or two) to your setup. SVS Prime Elevation delivers quite amazing audio performance. The only thing we were not impressed by, was the low-end reproduction. The bass is present but not really impactful and full-bodied, but that’s kind of expected considering the size of this speaker. The price is another great thing. The speaker is not exactly cheap, but compared to some other brands like Klipsch or Sony, the price is affordable. You can have a pair of these for $400 (the black ash version) or $500 (piano gloss black and piano gloss white). SVS Prime Elevation is probably the most versatile home theater speaker on the market. It’s a great choice if you have a small room and you can’t place all the home theater speakers at your ear level. 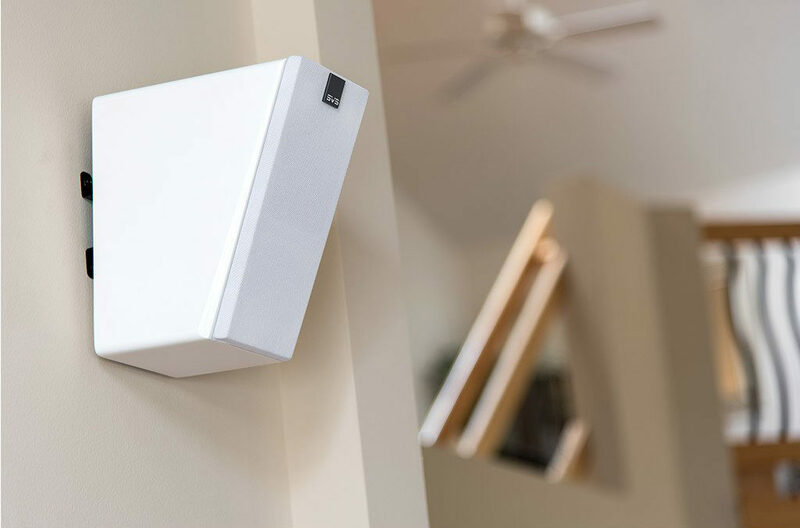 Unlike other height speakers (in-ceiling or height modules), SVS Prime Elevation can also be used as a front, center, or surround speaker, and it delivers an impressive performance. If you are looking for a relatively affordable multi-purpose home theater speaker, SVS Prime Elevation is an excellent option. SVS Prime Elevation comes in a simple cardboard box with speaker illustrations and specs listed on it. Along with the speaker, you will get a detailed user manual with all kinds of installation and placement tips, wall brackets with a wall mounting template, other hardware needed for the installation (screws and wall anchors), and a 5-year warranty. Speaker wire is not included and you can buy any 12 or 14-gauge wire. 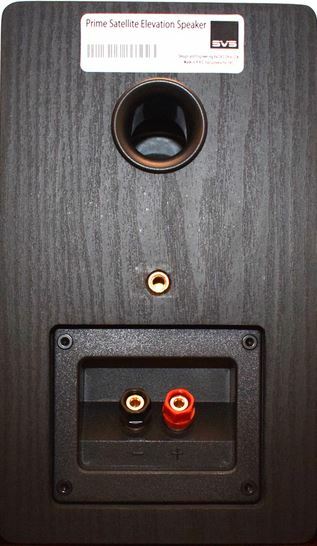 The manufacturer recommends its own SVS Soundpath speaker wire and their wire terminals (banana plugs and spade connectors). SVS Prime Elevation is a simple, yet very elegant-looking speaker. It features an interesting angled design, but it wasn’t designed like that for fun. That angled front baffle is one of the things that makes this speaker so great and incredibly versatile. It enables all kinds of placement options. SVS Prime Elevation is available in three colors – black ash, piano white, and piano black. There’s a significant price difference ($100) between black ash and the other two versions. They all deliver the same performance so if you want to save money, you should go for the black ash model. The speaker is not large but it’s quite heavy (almost 8 pounds). The cabinet is made of hard MDF. On the front side, you will see a removable fabric grille with a magnetically attached SVS logo at the bottom. The grille protects two drivers – 4.5-inch polypropylene cone woofer and 1-inch aluminum tweeter. You can install it with or without the grille, it’s all up to your personal preferences. On the back side, you will see 1-inch rear-firing bass reflex port, wall mounting port, and 5-way binding posts. SVS Prime Elevation is a very well-made speaker. It has a very strong resonance-free ported MDF cabinet. The most distinctive feature is the angled front baffle. This is the thing that allows all kinds of placement and makes the speaker so versatile. The midrange woofer has a diameter of 4.5in. It’s a cone woofer made of polypropylene. It’s very stiff, but also quite light which enables great accuracy and dynamics. The tweeter is located beneath the woofer. It’s a dome tweeter made of aluminum and has a diameter of 1in. Inside the speaker, there’s a 2-way high-quality crossover. The crossover frequency is set at 2.5kHz. We have already mentioned the removable grille and detachable magnetic SVS logo on the grille (so you can flip it and attach it again to the grille depending on the speaker position). You will also get wall brackets. They are specially designed for Prime Elevation speakers. Thanks to that specific angled design and high-quality components and cabinet, this is one of the rare full-range height speakers. Its frequency response spans from 55Hz to 22kHz, impedance is rated at 8Ω, and the sensitivity is 87dB. During the installation, you will realize why is this speaker advertised as the world’s most versatile speaker. There are so many placement options. Depending on your needs and on the intended purpose, you will have to place the speaker/speakers differently. SVS was primarily designed as height speaker, so let’s talk about the placement and installation of height speakers first. You are supposed to install it high on a side wall, close to the ceiling and aim it at your listening position (sweet spot). 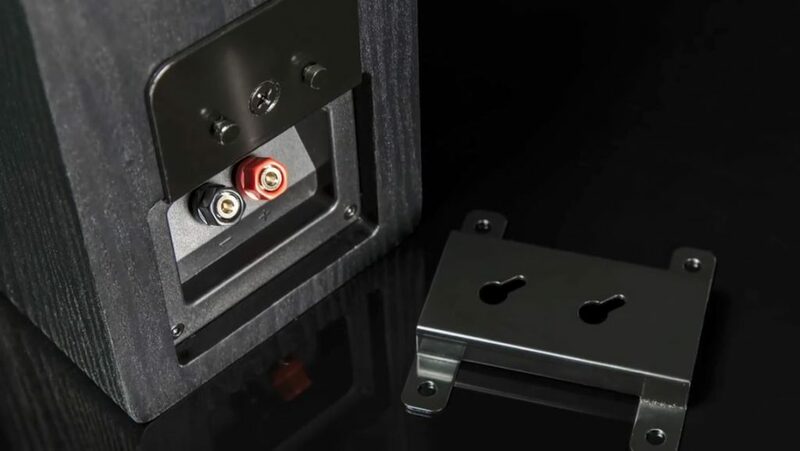 You just have to follow the instructions from the user manual, use the provided mounting template to mark the holes, drill the holes and install the brackets, and then attach the speaker to those brackets. Wiring is always tricky (especially hiding the wires). You should also be aware that there is not enough space for banana plugs when the speakers are wall-mounted. It’s probably smarter to use bare wires. Thanks to such a great performance, you can also use SVS Prime Elevation as your front or center speaker, especially if you don’t have enough space to place some larger bookshelf or floorstanding speaker on the left and right side of your TV. SVS Prime Elevation speakers can be placed above (wall-mounted) or below the screen and depending on the position, you should adjust the speaker orientation (down-firing position if they are above the screen or up-firing position if they are below the screen). You can also use SVS Prime Elevation as your surround speakers (side and rear surround). If you don’t have enough space, you can even mount them on your wall horizontally. 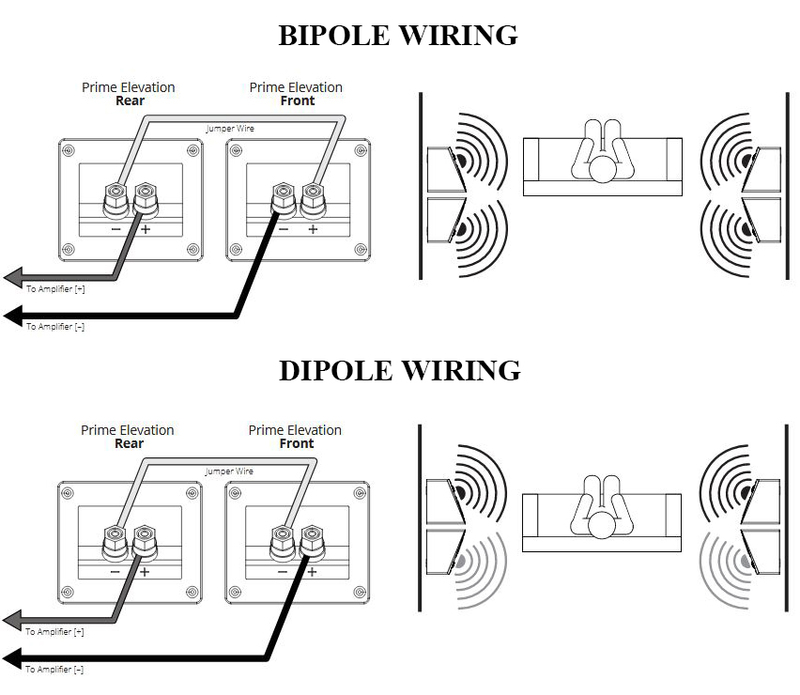 In the user manual, you can even find some tips on how to combine two sets (4 speakers) and make bipole or dipole surround speakers. In order to use the speakers in bipole/dipole mode, you need an amplifier (AV receiver) that supports at least 7.1 speaker system. The wiring is very simple. As you can see, the number of possible placement options and different purposes is amazing. This speaker can be your center, front left or right, surround (left or rear), bipole or dipole surround speaker, and of course, it can be your height speaker. SVS Prime Elevation is a very good-sounding home theater speaker. The greatest highlights are midrange and treble reproduction. The bass is present, but anything below 60 or 70Hz sounds weak so it’s probably smart to set the crossover frequency between the sub and speakers (in case you are using them as front or center speakers) to 70Hz. The midrange is very dynamic and detailed. All the vocals, starting from deep male vocals to high-pitched female vocals, are exceptionally clear. The crossover between mids and highs is nicely tuned and the transition is smooth and pleasant. The treble is crisp and clear. The speaker impedance is 8Ω and any average AVR should be able to drive them. 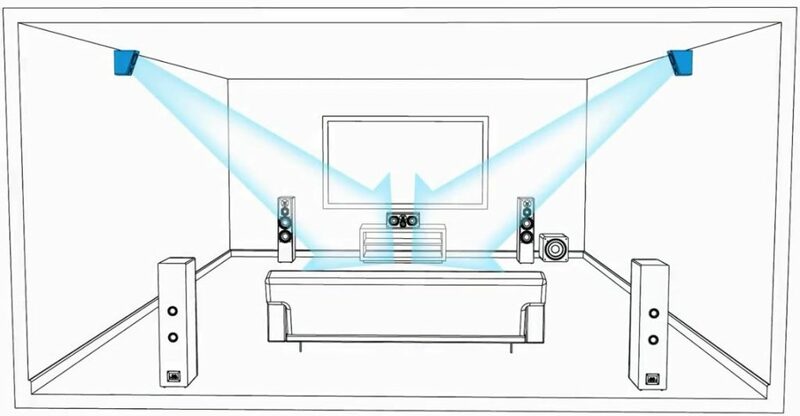 Of course, if you want to use them in bipole/dipole configuration, you need a receiver that supports 7.1 configuration (or higher), and if you want to use them as height speakers, you need a receiver that supports Dolby Atmos and DTS:X. We have used Yamaha RX-V683BL for our testing. When used for object-based height effects, SVS Prime Elevation speakers deliver an immersive listening experience and make the soundstage much bigger/higher. They sound better than any in-ceiling speakers or height modules. They also deliver an amazing performance when used as surround speakers. They can also be used as front and center speakers and, in some cases, they may be your only option (especially if you don’t have enough space). They offer above-average sonic performance, but there’s a bunch of better options. The market is flooded with all kinds of high-performance bookshelf, floorstanding, and center speakers. If you have enough money and space, you could combine some Klipsch bookshelf/floorstanding and center speaker (Reference Premiere line, for example) with SVS Prime Elevation surround and height speakers. Depending on the intended purpose, the number of viable options will be different. If you are looking for height or surround speakers, SVS Prime Elevation speakers are one of the best. If you need a center or front left/right speaker, the number of great choices is pretty big and SVS Prime Elevation is good but not the best option. 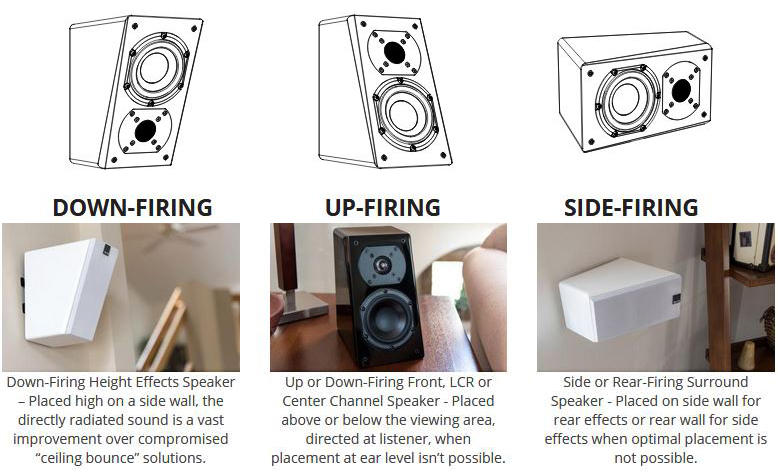 Since SVS Prime Elevation is primarily designed as height speaker, we have prepared a list of 3 viable alternatives. They all feature angled baffles and some of them can be mounted on a wall, just like SVS Prime Elevation. Unlike SVS speakers, these are all sealed and have limited frequency response which also limits the number of different applications (they can only be used as height or, in some cases, surround speakers). R-14SA is an elevation speaker from a very popular Klipsch Reference line. This speaker is practically priced the same as SVS Prime Elevation (set of two for approx. $400). 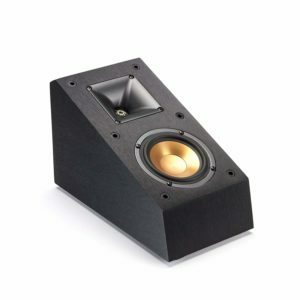 It features the same angled design as SVS Prime Elevation but it’s supposed to be placed on a Reference bookshelf or floorstanding speaker. It can also be mounted on a wall and it can be used as a surround speaker. Just like SVS speaker, R-14SA features sturdy MDF cabinet. The speaker has one woofer (4-inch copper woofer) and one tweeter (recognizable hybrid Tractrix Horn technology). R-14SA is not a full-range speaker, it has recessed frequency response and it’s not as good as SVS Prime Elevation when it comes to bass and low-midrange reproduction. R-14SA is a perfectly fine choice if you need a height speaker or surround speaker, but SVS Prime Elevation is definitely more versatile and delivers fuller sound. ELAC Debut 2.0 is another popular and highly praised line of speakers. A4.2 is, unlike SVS Prime Elevation, a standard height Dolby module and it can only be placed on top of your left and right (bookshelf/floorstanding) speakers. 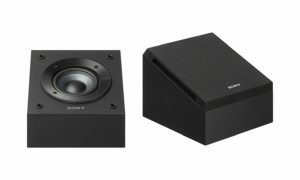 A pair of A4.2 speakers is significantly cheaper than SVS Prime ($200 compared to $400). A4.2 is not as versatile as SVS Prime Elevation. It has only one purpose and it cannot be mounted on a wall. The speaker features two coaxially arranged drivers – 0.5-inch tweeter and 4-inch woofer. Compared to other height modules, A4.2 delivers an impressive performance, but you can’t really compare it with SVS Prime Elevation (sound bouncing of the ceiling VS direct-radiating sound). SVS Prime is our favorite and it delivers better audio performance, deeper and punchier bass, and greater versatility in terms of placement. Sony SSCSE height modules are the most affordable option. 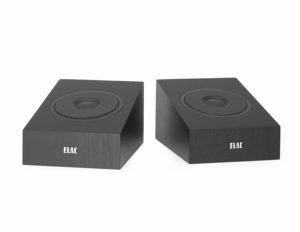 In terms of design and size, they are very similar to ELAC Debut 2.0 A4.2. They are supposed to rest on your front left and right speakers but they can also be mounted on a wall and used as height or surround speakers. Just like A4.2, Sony SSCSE features coaxially arranged woofer and tweeter. They do a very good job as height speakers. The performance is slightly better when they are mounted on the wall. Just like SVS Prime Elevation speakers, Sony speakers feature 5-way binding posts. SVS Prime Elevation speakers deliver fuller and more detailed sound than Sony SSCSE. Sony speakers can only be used as height or surround channels. SVS Prime Elevation is one of the best height speakers on the market but that’s not what makes it so special. This speaker’s sonic performance and its versatility are the most amazing things. The number of different applications and placement options is incredible. You can even make a home theater speaker system with 5, 7, or more SVS Prime Elevation speakers and one or two subwoofers. This speaker is particularly useful if you don’t have enough space to install some full-size bookshelf or floorstanding speakers as your front left and right channels. 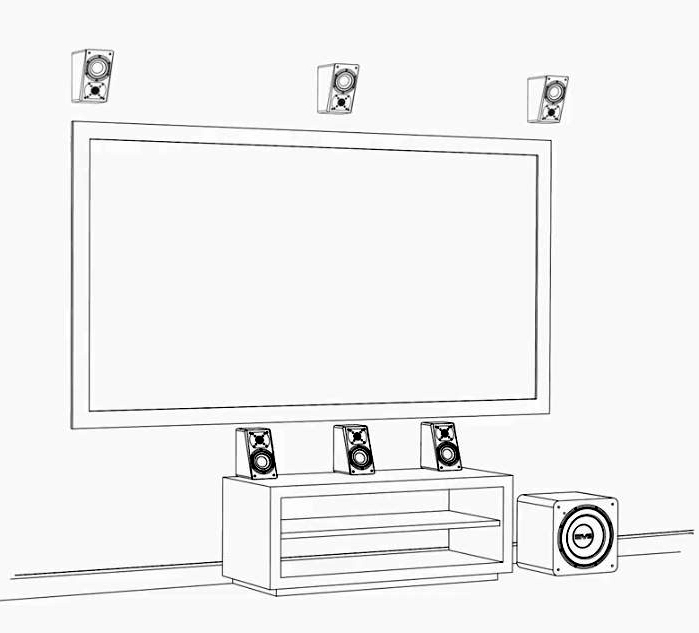 Instead of that, you can install 2 or 3 SVS Prime Elevation speakers above or below your TV. That way, you will save a lot of space and money, and you will get an impressive performance and immersive listening experience.